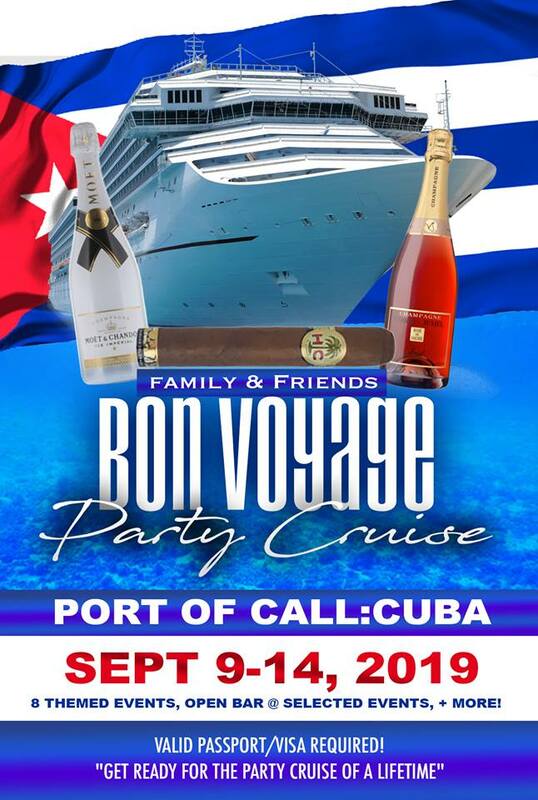 Empire Dynasty Travel proudly present to you the 2019 Family & Friends: Bon Voyage Party Cruise to Cuba. Join us as we embrace Carnival’s Sensation and set sail to Cuba with family and friends while meeting new family and friends with eight themed events, open bar at selected events, making memories, enjoying the sun, and having a whole lot of fun!!!!! We will be departing Port of Miami (Miami), FL on Monday, September 9, 2019, and returning, Saturday, September 14, 2019. To intensify your Family & Friends Bon Voyage Experience, Empire Dynasty Travel, is proud to introduce our 2019 Family & Friends Ultimate Fantasy Party Pass! This pass includes access to all 2019 events, open bars at selected events, A private welcome reception, "Cuban Nights Party," "Grown & Sophisticated Theme Party," and much, much more. Party Passes are $275 per person. A bang for your buck! 2018 Returning Guest Appreciation Flash Sale! (Applies To Any Empire Event): All deposits for Cabin + Party Pass submitted by 11:59 PM CST on/or by 12/31/2018 will receive $20 off the Party Pass! Must check the box for "past guest" on the registration form. 2014, 2015, 2016, 2017 & 2018 Returning Family & Friends Affair Guest Appreciation Flash Sale! All deposits for Cabin + Party Pass submitted by 11:59 PM CST on/or by 12/31/2018 will receive $25 off the Party Pass! Must check the box for "past guest" on the registration form. Reserve YOUR Cabin with $25 Today! Room Rates: TOTAL CABIN RATES (includes port charges & taxes) DOES NOT include party pass! *Party Pass includes access to ALL 2019 events: open bars @ selected events , and much, much more. PARTY PASS (includes all events)-- for guests who book outside of the Family and Friends-Empire Dynasty Travel group. including snorkeling, unlimited beach time while on island till 4p. Island Tour (Cuba)- $60 r/t per person-see many of the sites and sound of the islands, round trip. Rates subject to increase after May 5th, 2019!. Book Now! You Won't Find a Better Price for This Family & Friends Affair Cruise! NOTE: Valid Visa & Passport required for this sailing! Carnival will issue the Visa & will charge to your Sail & Sign Account! NOTE: It is important that guest's full name on the cruise ticket be the same as the guest's passport they plan to use for travel identification. Do You Have A Fourth Guest? Party Pass-- for guests who book outside of the Friends & Family-Empire Dynasty Travel group. Friends & Family Fantasy Island Getaway Excursion (Grand Turks) - all you can eat, all you can drink cocktails while on the island, all ground transfers, unlimited non motorized water sports including snorkeling, unlimited beach time while on island till 4p. Empire Dynasty Travel acts as a sales agent for any airline, hotel, car-rental company, tour operator, cruise line, or other service provider named in your itinerary (“Suppliers”). Empire Dynasty Travel is not responsible for acts or omissions of the Suppliers or their failure to provide services or adhere to their schedules. Empire Dynasty Travel, assumes no responsibility for and shall not be liable for any refund, personal injury, property damage, or other loss, accident, delay, inconvenience, or irregularity which may be caused by: (1) any defaults, wrongful or negligent acts, or omissions of the Suppliers; (2) any defect in or failure of any vehicle, craft, equipment, or instrumentality owned, operated, or otherwise used or provided by the Suppliers; or (3) any wrongful or negligent acts or omissions on the part of any other party not under Empire Dynasty Travel control. You now release Empire Dynasty Travel from all claims arising out of any problem covered in this paragraph. You acknowledge and understand that cruise lines, tour operators, and other Suppliers have their contracts covering cancellation penalties and other terms and conditions and that you may be bound by those contracts regardless of whether you receive notice of their terms. Empire Dynasty Travel has no specialized knowledge regarding the financial condition of the Suppliers, unsafe conditions, health hazards, weather hazards, or climate extremes at locations to which you may travel. For information concerning possible dangers at destinations, Empire Dynasty Travel recommends contacting the Travel Warnings Section of the U.S. State Department at (202) 647-5225 or www.travel.state.gov. For medical information, Empire Dynasty Travel recommends contacting the Centers for Disease Control at (877) FYI-TRIP or www.cdc.gov/travel. You assume complete responsibility for checking and verifying any passport, visa, vaccination, or other entry requirements of your destination(s), and all conditions regarding health, safety, security, political stability, and labor or civil unrest at such destination(s). You now release Empire Dynasty Travel from all claims arising out of any problem covered in this paragraph. You agree that the courts in Jackson County will be the exclusive jurisdiction for all claims brought by you or Empire Dynasty Travel, and you now submit to the personal jurisdiction of those courts. For your protection, we strongly recommend that you purchase trip travel insurance. We also strongly recommend that you use a credit card for your purchase so that you can exercise your rights under the Fair Credit Billing Act if you do not receive the services you purchased. Initial invoice emailed to group leader with all cabin guest copied in on the email to make payments. The invoice will include the total cabin rate for all guest. Once entirely deposited, you will receive cabin invoice from Carnival--do not pay Carnival invoice only agency invoice. Please be advised the entire balance will reflect on your invoice. You may select the "edit" button to make the desired payment.